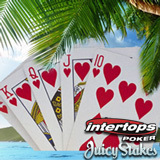 Intertops Poker and Juicy Stakes Poker are giving you another chance to win your way to the Caribbean -- two more chances, in fact! The two leading online poker rooms on the Horizon Poker Network are hosting online satellite tournaments this month that will send the winners to the $500K Punta Cana Poker Classic and the $500K PPC Aruba World Championship. These are three-tier tournaments. You can buy in at any stage or try to win your way to the Finals starting with a $2.20 buy-in Step 1 tourney. Punta Cana satellites are held several times daily, July 18 - 24. The champion will win a $5000 prize package that includes $1650 buy-in to the Main Event and six nights at the luxurious five-star Meliá ‘The Level’ Resort. The Punta Cana Poker Classic gives players lots of time for fun in the sun and, with a full schedule of tournaments, plenty of opportunities to win some cash. The winner will join “jetlag4ever” who won an earlier satellite series. Satellites for $500K Punta Classic continue until July 31. Win the PPC Aruba satellites, July 25 – 31, and you'll receive a prize package that includes $2,400 buy-in to that Main Event and accommodation at one of the island’s top resorts. Both packages include accommodation, travel expenses and Intertops or Juicy Stakes gear as well as dinner and a night out with the Intertops or Juicy Stakes team. Intertops tournament details: Punta Cana satellites and Aruba satellites. Juicy Stakes information: Punta Cana and Aruba. Check out the Living the Dream poker blog for videos with winners of previous online satellite tournaments sharing their poker adventures abroad.